Listed below are sources of information relating to farming in the North Northumberland area, along with statistical data for agriculture in Britain, from the 19th to the 21st century. For 19th century farming in Northumberland, the Woodhorn and Northumberland Archives have produced a Farms Index for 1860. It lists the farms by name and gives the township and parish in which they were situated. Sheep Tales & Spinning Yarns is a website developed from a project based in North Northumberland, and it tells the story of sheep farming, shepherding and lives of families living in the border hills past and present. It offers many contemporary and historical photographs, as well as an archive of oral histories from local people. 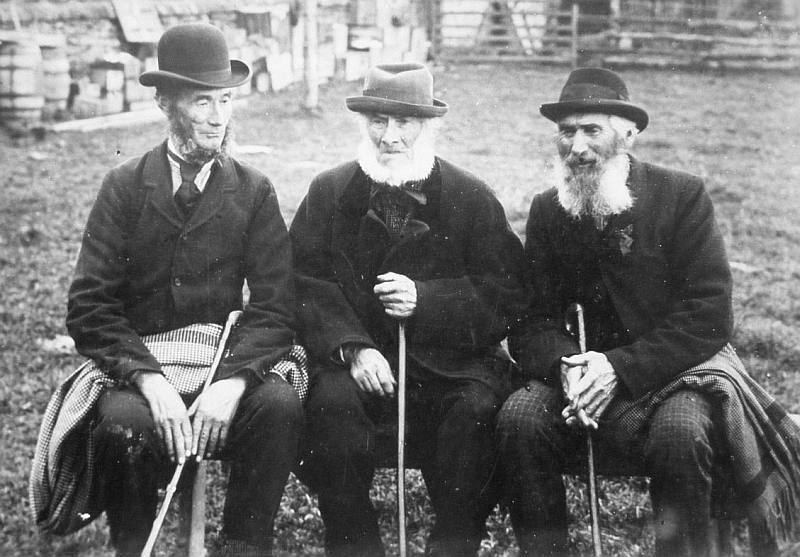 Photograph of three sheep farmers from Langleeford in the Cheviot Hills, taken in the early 1900s. © Berwick Record Office. Banner image: (a) Early 1900s farming scene, showing a horse drawn reaper-binder. © whatsthatpicture from Hanwell, London, UK [CC BY 2.0], via Wikimedia Commons; (b) see main picture above.